A woman dubbed 'Britain's most frugal mum' has succeeded in buying nothing new for an entire year in a bid to cut down on waste. Katie Musgrave, 33, from Loddiswell, Devon, made the pledge on December 1, 2016 after becoming sick of the amount of barely-used equipment, clothing and toys that were cluttering up her home. 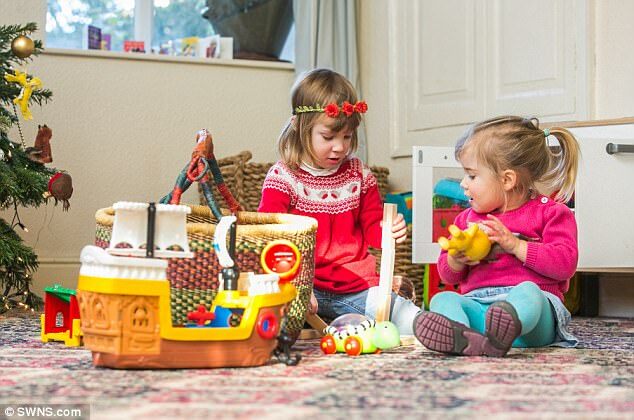 She banned herself from purchasing anything new for herself or her children Eliza, four, and Ariadne, two, for 12 months - apart from food and nappies - and has succeeded apart from a single 'blip', buying shoes for her daughters. 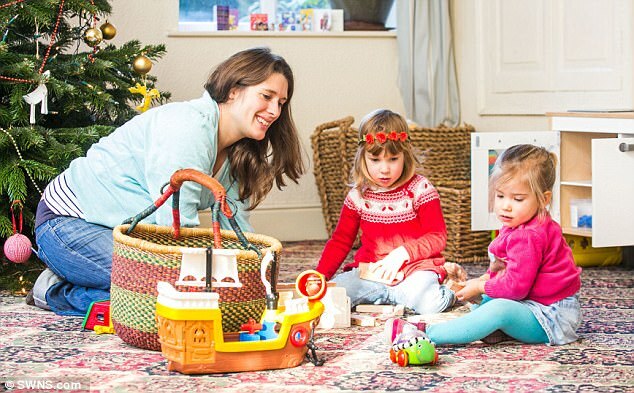 The thrifty mother scoured the internet for pre-loved toys and snapped up second-hand clothes at charity shops for 12 months - saving herself £700 in the process, which went towards a skiing holiday for the family of four. But after reaching her 12-month target at the beginning of December, Katie, who is currently pregnant with her third child, decided that trawling round charity shops for gifts was too tiring. As such, she has given in and bought some Christmas presents as new, but insists she still snapped up some gifts second-hand. Katie, a GP registrar, said: 'With Christmas and birthday presents I've saved a few hundred pounds alone. Some people could probably save thousands and thousands. 'Buying gifts wasn't too difficult, most of our family were open to accepting second hand presents, and I made the effort to look around charity shops until I found presents of high enough quality. Books were quite good. 'This year I've gone 50/50, because I'm quite heavily pregnant I've had to do shopping online, some has been on eBay but some of it has been from Amazon. 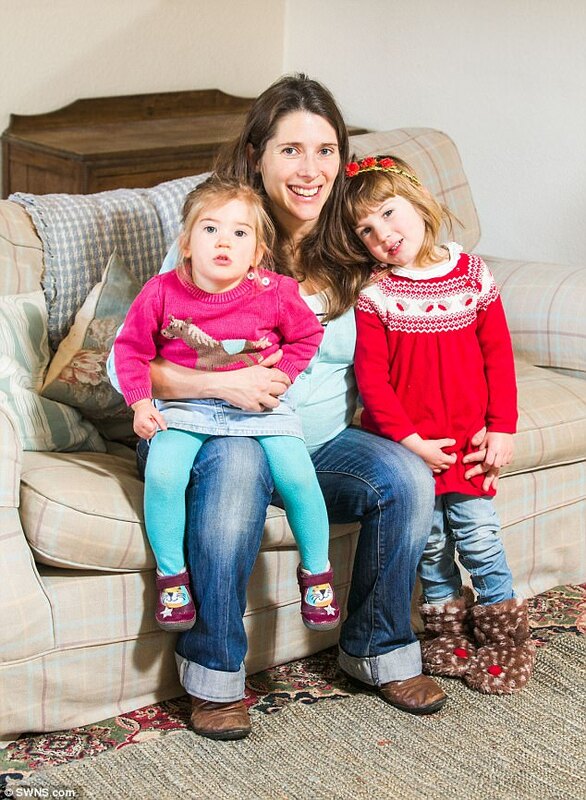 Katie, who is now expecting her third child with GP husband Chris, 36, managed the whole year with only one 'blip'. 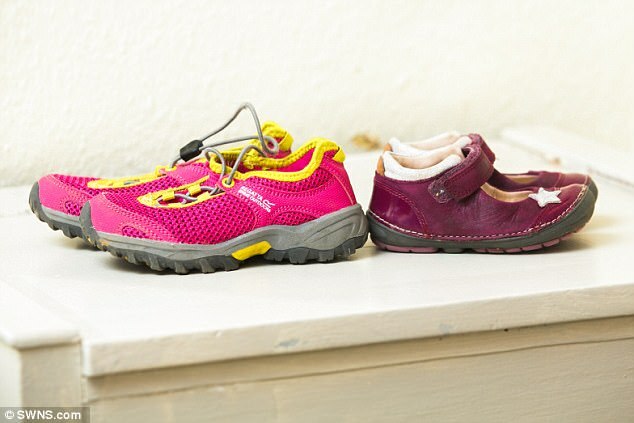 She bought a pair of Regatta trainers for her eldest, and a pair of leather shoes from Clarks for her youngest. She bought both of them in sales, however, at just £30 for both pairs. Katie added: 'In terms of clothes, toys, equipment, I've not bought anything new for me and the children, except for the shoes for the girls, everything else has been second-hand. 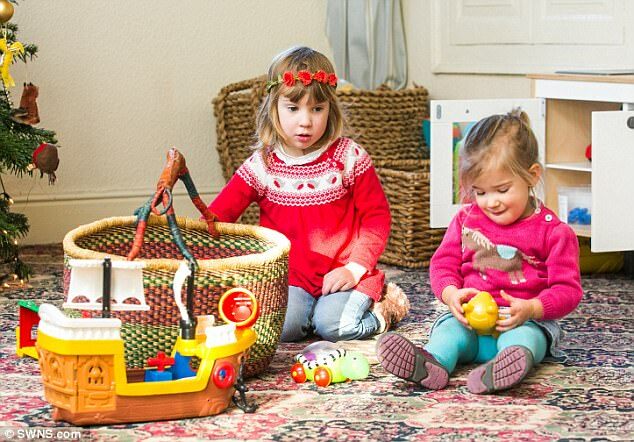 'It went pretty well, in all we spent a whole year without buying anything for my girls. 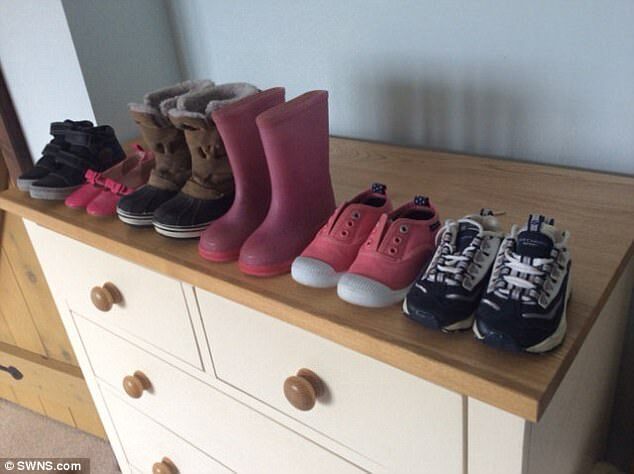 'I bought both girls a pair of shoes in the summer because they had outgrown theirs and I wanted them to have some comfortable shoes they can wear day in day out. 'I bought a pair of trainers in the sale for my older daughter, they were £9 online, they were Regatta trainers, and a pair of Clarks leather shoes for my younger daughter, they were about £22 I think. Katie added: 'It was fine, we went round charity shops and had hand me downs from friends and family, and bought things from eBay. 'It genuinely wasn't that challenging, we went to charity shops every three weeks or so, and we bought things second hand. Katie said that with just a little effort they were able to live a life better than when they were living a more frivolous lifestyle. 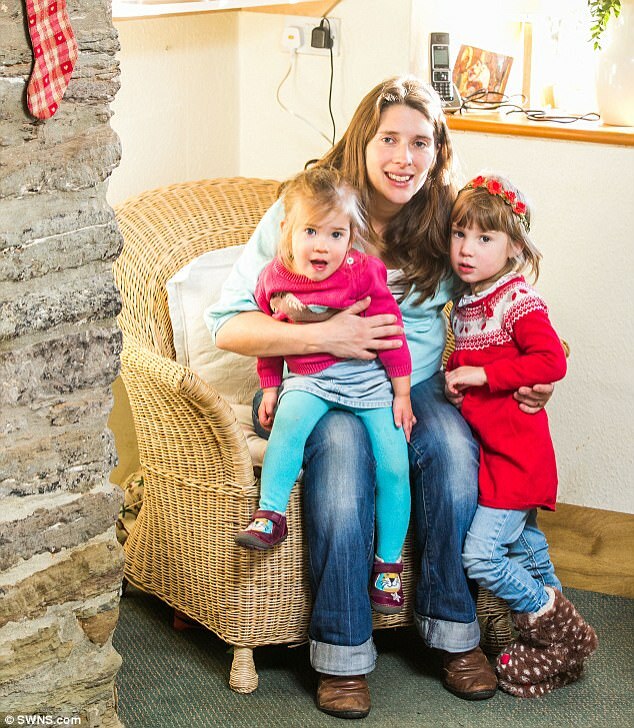 'By saving money month by month we were able to go on a nicer holiday with [the children], we took them skiing for the first time - with second hand ski suits for all of us,' added Katie. 'My husband sorted himself out, so he bought new things, but I didn't find it difficult at all. I bought myself a ski jacket second hand and a new winter coat, both were £5. Over the year Katie believes she has saved up to £700. 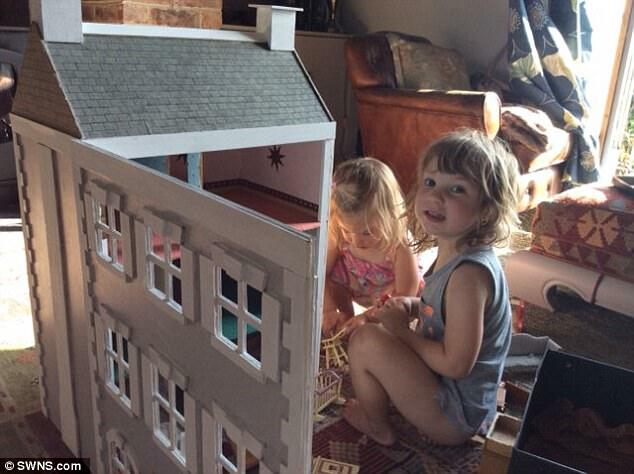 She explained: 'I've saved a fortune; at Christmas last year I spent £20 for my two and four year olds, and likewise birthdays. 'I would probably say I've saved around £500 to £700,' said Katie, who claims she is naturally more frugal than the average parent even when not following her New Year challenge - and believes others could save even more by following her approach. 'I think the idea is widely spread that children need new clothes and toys and the latest furniture for their bedrooms, but they absolutely don't,' Katie said. 'Twenty to 30 years ago we all wore hand-me-downs, but I think lots of companies now try to encourage people to buy things they really don't need and spend money that people with small children don't actually have to spare. She added: 'At the moment I think it's crazy that there isn't anything functioning nationwide for children's ware, there are so much clothes sat in attics and garages. 'There must be 5 million parents out there who could sign up. I think there is a massive audience out there. One Baby Owner is due to be re-launched in spring.